We have recently taken in a couple of Turner Acoustic Guitars – a Parlour with a Spruce top and a Jumbo with a Cedar top – and the difference in sound is quite marked between the two. I have started to see a lot of cedar topped guitars lately from the mainstream acoustic manufacturers. Cedar is darker in colour and has traditionally been used on classical guitars but is now becoming more prevalent on steel strung acoustics. Spruce tends to be the most popular top for acoustics (confusingly there are several varieties of spruce used on guitars!) and has in general a bright sound whereas cedar is warmer with less high end sparkle. Both are high quality tonewoods so which one you choose is up to how and what you play and what your ears go for! Cedar tends to be a less hard wood than spruce and gives, generally speaking, a quieter projection but more character, losing clarity when strummed hard; consequently, it tends to be favoured by finger pickers (hence its use in classical guitars!). As you know acoustic guitars get better with age and open up more as the wood is played in and with cedar this happens faster giving a richness of tone sooner. 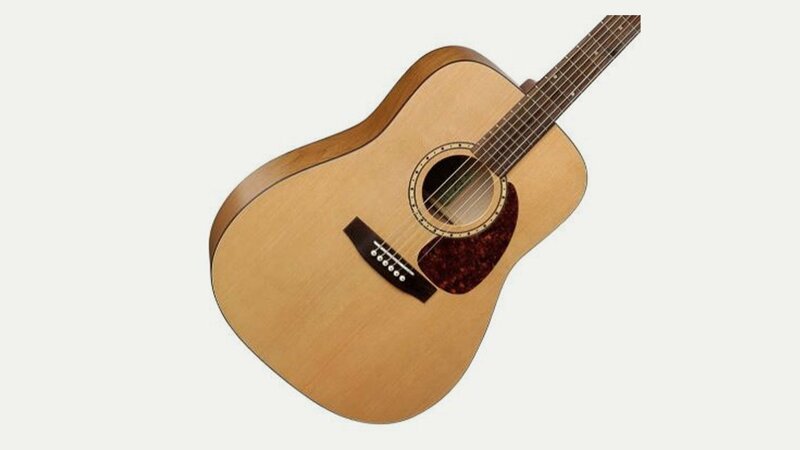 For comparison pick up a Martin with a spruce top – these are renowned for taking years to mellow out – and any cedar guitar and you will hear the difference! Although we are talking tone here, you should bear in mind that spruce is a ‘tougher’ wood than cedar which will mark and ding much more easily, but if you don’t mind your guitar looking played in, no problems!